After ten years in Australia, Karen Riney returns to Ireland after the death of her husband. On the rebound she ends up in Kerry with Jake, who is paying off a debt to Dublin crime boss, Pascal Nix by running a grow-house. When the house is raided and Jake arrested, Karen heads to Dublin with the idea of using her new knowledge and Jake’s contacts to go into the grow-house business herself, with the aim of making enough money to make a fresh start. Without the capital for set-up costs she turns to Nix, a man nobody wants to be in debt to. As Kevin Wyman well knows; a builder who chased the bust to the bottom, borrowing money from Nix to try and keep his business float. Nix ensures a healthy return on his investments through the services of Charlie Small, an overweight thug, and Dara Burns, a cold hearted killer for hire. Karen has little conception of the terms of her debt, confident that she can use her business skills to make a quick profit. But when Nix is involved there’s no such thing as easy money. 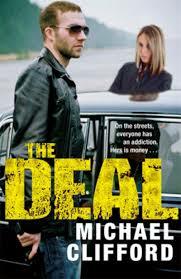 The Deal is a story about ordinary folk, down on their luck in a recession, turning to the fringes of crime to try and make a quick buck and keep their heads above water, and the criminals who exploit them ruthlessly. It had a strong feel of social realism, as might be expected from a journalist author, and my sense was it gave a good portrayal of dark underbelly of post-Celtic Tiger Ireland, much like Clifford’s excellent first book, Ghost Town. Indeed, the story is an interesting tale and its competently told, but it felt a little flat until the last third when it picked up in pace and tension. Likewise the characters felt somewhat two-dimensional and I never really connected with them or their troubles. Overall, then, whilst the plot was well worked and is a timely portrait of contemporary Ireland, the telling seemed to lack bite and sparkle. 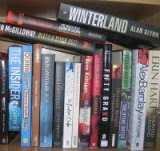 Nevertheless, I look forward to Clifford’s next offering.